Looking For A Simple, Effective Solution For At-Home Exercise That's Affordable Too? When you're looking for exercise equipment for your home you usually discover two things: It's expensive and it takes up a ton of room. That's why a mini indoor trampoline is the product you've been looking for! Designed to provide low impact workouts that strengthen your muscles and your cardiovascular system, mini trampolines are a great way to stay in shape without breaking the bank or sacrificing an entire room. 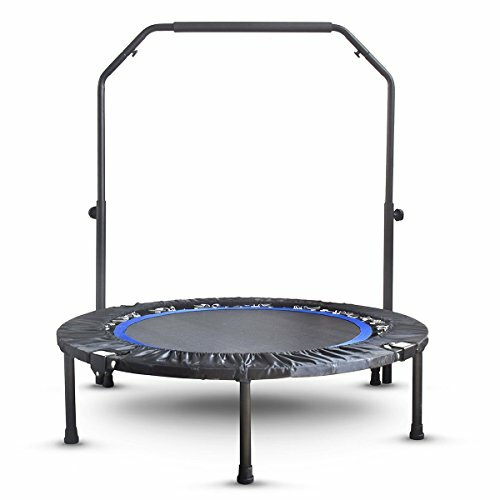 Our small mini trampoline features a sturdy frame and an adjustable handle that is appropriate for adults of all sizes. When you're done exercising, you can fold the trampoline in half and fold the legs for easy storage. It even fits under most beds! Enjoy exercising in your home and click "Add to Cart" today! The best mini trampoline for adults. Gives you the exercise you want from the comfort of your own home, so no need to trek to the gym! Sturdy 40" frame and capacity up to 220 lbs. Adjustable handle bar allows you to stay safe and comfortable during indoor jumping workouts. Positioned at optimal height for most adults, and can switch to be great for kids or toddlers. Your rebounding fitness trampoline has a folding frame and legs, making it easy for you to store out of the way when you're not using it. Only see your exercise trampoline when you need it! This rebounder with bar includes accessories like a spring cover that helps to prevent any accidental pinching. A great way to keep fingers and toes safe from while working out! Our mini indoor trampoline is made with durable materials that last. We are confident you will love exercising at home with this product! 3 Year Satisfaction Guarantee and FREE spring cover included when you order today, so click Add to Cart and Buy Now! If you have any questions about this product by Activox, contact us by completing and submitting the form below. If you are looking for a specif part number, please include it with your message. Needak Mini-trampoline Rebounder R04 non-folding Black for Heavier Users. Supports Weight of Over 300 pounds.